There has been a lot of interest in my dogs learning lots of tricks and earning trick dog titles. 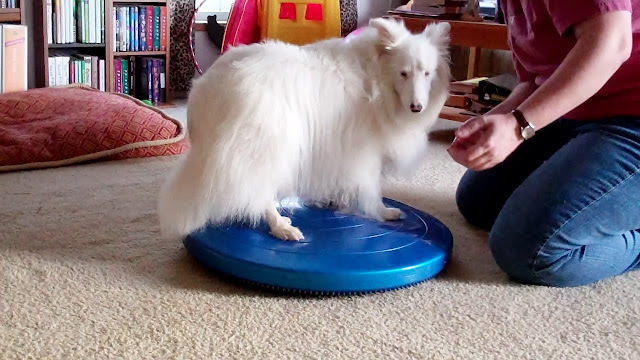 Many people who also have differently-abled dogs have asked me to share how I teach the various tricks to my dogs that are deaf and blind/deaf. I've put together an online course that will help you teach your dog beginner level tricks, using techniques that are fun for you and your dog. You can even have a chance to then earn your Novice Trick Dog title at the end of class. I always teach with positive reinforcement methods, so teaching and learning is fun for everyone! One of the great things about this class is that you get expert instruction anytime that is convenient for YOU! The class is online, but you don't need to be sitting by your computer at a certain day or time. Lessons are published in an online classroom beginning Jan. 20th, with new lessons every week. You can read and view the lessons at any convenient time, and then practice with your dog as it suits you. I check the classroom and the private facebook page daily to give feedback and answer questions so I can help you be successful. These classes are great fun and give you a focus for your training sessions with your dog. Come join people and dogs from all over the world! We have a fun community! 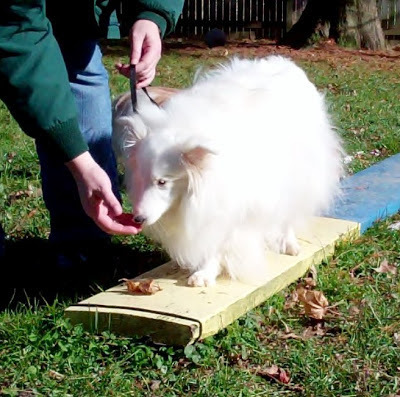 Class will cover instruction for adapting certain tricks and teaching techniques for dogs that are blind, deaf or blind/deaf. However, we are an inclusive school and we encourage ALL dogs and people to join along! The more the merrier! For more information about the tricks class, head over to Tricky Tricks - Beginner to have a look! We also offer other classes, and have several new ones planned to be rolled out later in the year. You can check out all our classes, as well as our free resources here. I'm so excited to be able to offer this class to all of you! You've been asking for awhile now - and it's finally here! I can't wait to get started! I really enjoyed taking the Grooming, Husbandry and Handling class last Fall. It was a lot of just plain fun. The most important takeaway was ME learning my dog and how to proceed at her level and not rush. The interaction in the FB group was great and the lessons and interaction on the website was really awesome too. I appreciated the feedback from Deb as well as our community. ~~ The only reason I am regretfully not signing up for this Tricky Trick class is that I am in the process of retiring and training staff to learn my job. TIME is what I don’t have enough of. ~~ Have fun and by all means sign up. It is a wonderful way to interact with your dog and really learn how to communicate with her/him. See you soon - when I have more time.